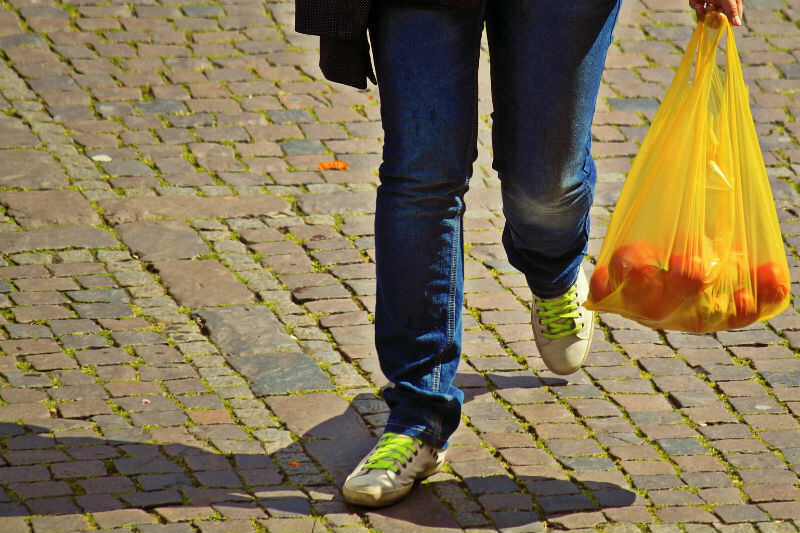 While Coles has announced this is an interim measure (until 29 August) to allow customers 'more time to make the make the transition to reusable bags', others argue that in the meantime it effectively removes all incentive for customers to bring their own. Worse still, these new reusable bags take even longer than the old single-use ones to break down once they are discarded, and this is often after just one use. But we are drowning in plastic. On current predictions, our oceans will contain more plastic than fish by 2050, and our food and drinking water is being contaminated by plastic microparticles. It is probably past time that we started taking this issue seriously. But it's easier said than done. I discovered this first-hand last month, when my seven-year-old son, Charlie, quietly asked me if we could please stop buying plastic. He had learned that it was polluting the ocean and hurting whales, and he wanted to do something about it. When I collected our veggie box that week, I asked if we could skip anything packaged. We are lucky in the Northern Rivers to have many excellent bulk food shops. So I felt relaxed about stocking up on grains, pulses, nuts, seeds, tea and spices. I started thinking this whole plastic-free thing was going to be straightforward. "This moral licencing is bad enough when the resources are actually being recycled, but it becomes a serious issue when we are actually just stockpiling the stuff." But when Monday morning arrived, I hadn't made any crackers or crispbread for lunchboxes. So, I opened a plastic packet of rice crackers and found myself grabbing some plastic-wrapped tofu from the fridge. I could feel my motivation slipping away. This was going to be much harder than I thought. Australians generate around 50 million tonnes of waste a year. While just over half of this is sent to recycling facilities, it is not always recycled, and recycling creates its own issues. While recyclers have historically stockpiled material like metal, glass or paper in response to reductions in their sale price, this stockpiling became the norm earlier this year, when China announced tough new restrictions on the kind of recycled waste it would purchase from overseas. We exported 29 per cent of all kerbside collected paper and 36 per cent of all kerbside collected plastics to China in 2017. Now 99 per cent of this waste will not be taken by China as it does not meet the new 0.5 per cent acceptable contamination threshold. One of the reasons for our failure to meet China's new standards is our long-term practice of comingled or single-stream recycling. This practice was adopted as a form of incentive to encourage household recycling and it worked — people are more willing to recycle when they don't have to sort their recycling. It is also cheaper for councils to collect a single recycling bin. But, eventually, someone does have to sort it all out. And that's expensive if you can no longer just ship it off to another country to deal with — especially since around ten per cent of the stuff we put in our recycling bins shouldn't be there at all. Another problem with recycling is that it actually encourages us to create waste. Researchers have found that people use considerably more resources when they believe that these resources will be recycled afterwards. This moral licencing is bad enough when the resources are actually being recycled, but it becomes a serious issue when we are actually just stockpiling the stuff. So here we are. Drowning in waste. Where do we go from here? This is an issue that we as consumers cannot solve alone. We need governments to step up and take action to increase real rates of recycling through major upgrades to domestic recycling facilities; encourage businesses (through both incentives and penalties); reduce waste; and take genuine steps towards zero waste targets. Of course, we also need to play our part. Not least in terms of not having tantrums when businesses do try to do the right thing. We can also take simple steps to dramatically reduce our contribution to the waste problem — use cloth bags, reusable cups, drink bottles, and storage containers. Try shopping at bulk food stores and farmers markets. Take your lunch to work and try making some of your own snacks — like muesli bars, bliss balls, and yes, even crackers. And, perhaps most importantly, just buy less stuff. Thanks Cristy, A real wakeup call for our 'throw away' society. Here in Canberra we have a successful ban on single use bags. We simply put our shopping bags in the boot and remember to bring them into the supermarket or shop-its very easy and NO hassle to learn. It's second nature now. As a retired secondary teacher, who spent years teaching students about environmental responsibility before it became trendy, I am so pleased to hear your daughter has heard the message and passed it on. The hard part as you have written , is putting the awareness into action. We are so time poor these days! EDUCATION is a major part of the answer but maybe an initial attack on the hip pocket nerve (tax?) is needed for the consumer, the supermarkets and the manufacturers to respond,before anything happens. Hopefully before it is too late for the planet. It is so sad that the protests of a spoilt, indulgent , loud mouthed few can have so a ridiculous response from Coles! Thanks Cristy for this very timely article about plastic waste that is contaminating our seas and the natural environment generally and causing a threat to wildlife and human health. One of the issues is that the large retailers try to project the image that they have concerns about plastic and are supporting the community by having recycling bins available. However, there seems to be a high level of continued use of film plastic to wrap fruit and vegetables - most of which is totally unnecessary. And we see reports that some of the recycled waste is being burnt! Much more needs to be done at all levels of government to ensure that it is made easier for people to be involved in the process of increasing the recycling of plastics. First, no products should be packed in materials that are not recyclable and non plastic packaging should be made readily available at retail outlets. South Australia has shown that having deposits on containers also encourages recycling. In addition, more kerbside collection needs to be provided as not all people have the mobility to transport their recyclables to other locations. While there is currently a concern about plastic, we need to be making more efforts to manage wastes that are even more toxic eg heavy metals, asbestos, a multitude of chemicals, radioactive substances, oils etc. For too long, the large corporations have taken little or no responsibility for many of these wastes. Governments need to have centres for the safe and responsible management of all wastes to protect the environment and public health.